Several weeks ago, a writer and editor approached me with this post on the role yoga can take in recovery. That person requested I share it with you. As a dedicated yogi in philosophy and practice, I was eager to share. I hope you will like it as much as I do. For individuals in recovery, the path to a healthier life requires a multifaceted approach. Physical, emotional and spiritual growth are all vital parts of the success equation. One practice that embodies all of these elements is yoga, and its use in recovery is a natural fit. The word yoga literally means “to yoke,” a uniting of spiritual, mental and physical practice. Yoga is not about achieving the incredible feats of flexibility that grace the covers of magazines in the checkout line of Whole Foods; in fact the physical postures are just one of eight “limbs” of yoga, including ethical standards, self discipline, postures, breath, sensory transcendence, concentration, meditation and ecstasy. The physical practice of moving through various poses—or asana—is meant to be a moving meditation. It is as much about connecting breath to movement as it is about achieving any sort of physical milestones. Pranayama—the limb that focuses on the breath—is a particularly poignant practice for those in recovery. By harnessing the depth and rhythm of our breath, we are able to tap into our parasympathetic nervous system and help its regulation. This helps us bring our heart rate and stress hormones back to a normal level after our “fight or flight” sympathetic nervous system response has been activated. For many people in recovery, the sympathetic nervous system is out of balance. Either they are actively seeking to tap into it by using stimulants, or working to quiet an overactive system by using sedatives. Addiction functions on many levels, but a common feature is a sense of detachment from the body. Yoga poses work by cultivating focus and attention on the body to help counteract this. Certain types poses are specifically indicated for people in recovery. “Child’s pose, squatting, standing pose and other grounding poses help establish a sense of feeling safe, feeling at home,” said Marcus Berardino, a Brooklyn-based yoga instructor and massage therapist who offers “yoga prescriptions” to his clients. “Inversions—or going upside down—help people see the world in a different way, which is exactly what they’re trying to do if they’re in recovery,” he said. The body of someone in recovery is a holding place for pain, and physical reminders of an addiction often linger long after sobriety has been established. Yoga therapist Weena Pauly, who teaches a method called Rising Phoenix Yoga Therapy, explains that the body gives us clues about our emotional state that we may not be consciously aware of. “In yoga therapy we might look at someone’s posture and see why its there, versus in a yoga class where we might look to correct the posture,” she said. Pauly feels that while 12-step programs are often highly effective, they do not include a focus on the body. Another common feature among individuals in recovery is a history of trauma. Both Berardino and Pauly cautioned against moving too quickly into poses that might be intense or evoke strong feelings of vulnerability too quickly, such as major backbends, or heart openers. “The person in yoga therapy needs support outside of the session when they’re headed into messier waters,” said Pauly. Yoga’s rise to popularity in the U.S. began in the 1950’s but was more widely popularized starting in the 1960’s, mainly as a result of more relaxed immigration laws that allowed for yoga gurus from India to remain in the U.S. for longer periods of time and disseminate their teachings. Yoga has been in practice in India for 5,000 years, but today’s yoga bears little resemblance to the ancient practice. In many classes, the spiritual teachings are rarely if ever mentioned and instead, an emphasis on the physical benefits—a longer, leaner, more toned physique—is the sole focus. While physical activity of any sort can still benefit individuals in recovery by providing them with a way to care for their bodies rather than do harm, this type of practice does not address issues of emotional regulation that can lead one to use substances in the first place. There is also a missed opportunity to work through step 11 of the 12 steps, which focuses on meditation. Fortunately, for those who are interested in pursuing yoga as a means to aid their recovery, resources are plentiful. Classes are becoming more prevalent at inpatient and outpatient treatment facilities. Yoga teacher Tommy Rosen, who is himself in recovery, hosts a free online conference featuring experts in the field of holistic recovery. There are yoga programs specifically geared towards those in 12-step programs such as Yoga of Recovery, which offers retreats in the Bahamas and other tropical settings. And with hundreds of free resources readily available on the Internet, yoga is an accessible and egalitarian form of recovery support. 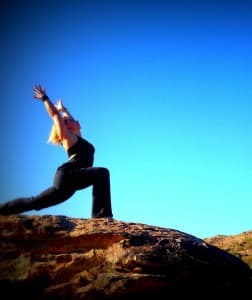 This entry was posted in Inspiration, mindful, recovery, yoga and tagged asana, health, recovery, yoga. Bookmark the permalink.